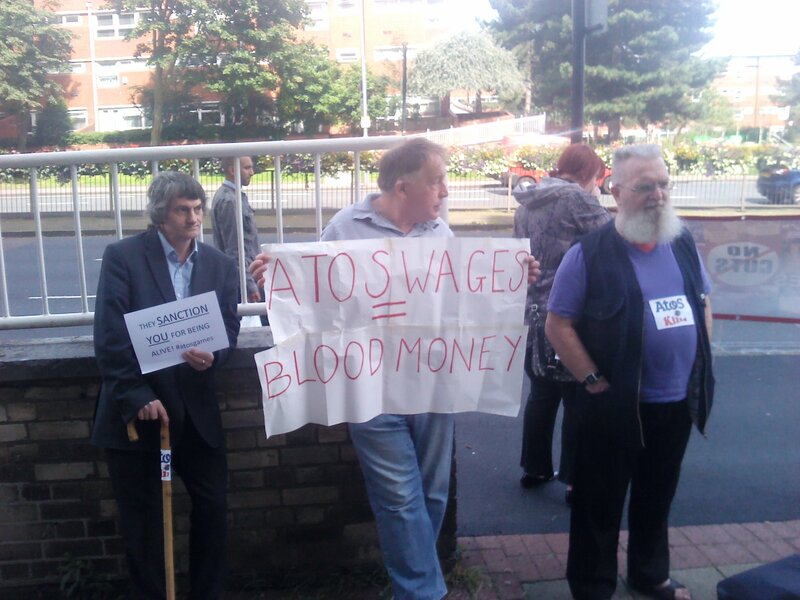 Around 20 people demonstrated today outside the ATOS assessment centre in Birmingham as part of a week of actionprotesting the Working Capability Assessment (WCA) which is run by ATOS for the Department of Work and Pensions (DWP) and is supposed to assess whether someone on disability benefits is fit for work, but has come under large amounts of criticism for failing to do that – and in the process punishing many disabled people by pushing them off disability benefits onto unemployment benefits and workfare.The week of action is taking place during the Paralympics because ATOS are one of the main sponsors. Their core business is as an IT outsourcing company, but like Capita and Serco they have moved into taking all government outsourcing contracts. The contract to run the WCA is £100m/year – and we pay an additional £50m each yearfor the appeals process to correct the huge number of people that ATOS declare fit for work who go through the appeal process and have the decision reversed – a process that can take over a year. Around 40% of appeal are successful – a figure that rises to 70% for people who have advocates or legal advice. Many people go to CAB for this advice, but Birmingham residents will soon find their access restricted, as funding cuts mean that CAB will probably be closing all but the city centre branch. 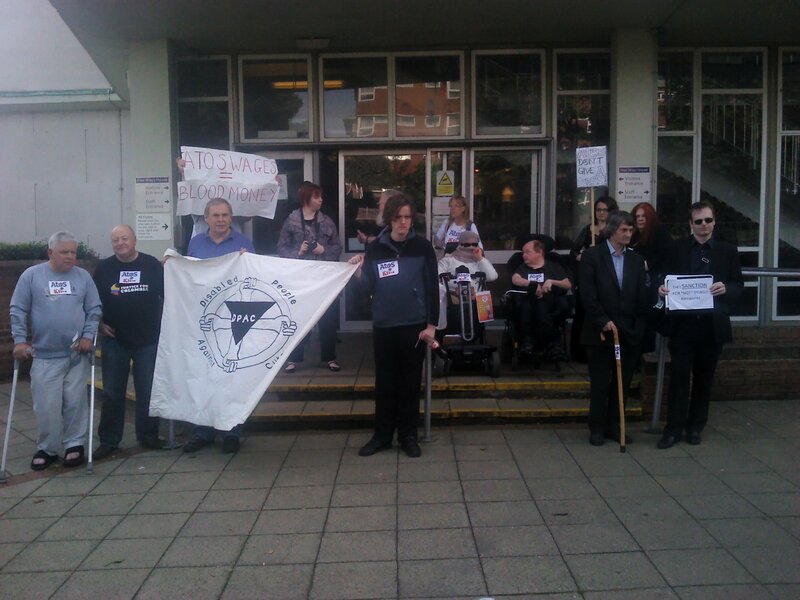 At the same time, legal aid is being cut for welfare & benefit appeals, firmly closing the door on disabled people accessing legal advice.In a recent Dispatches program, a doctor went undercover to record the training process for ATOS, and was told by his trainer that ESA (the new disability benefit brought in by New Labour in 2008 to replace Incapacity Benefit) and the WCA are designed to remove people from disability benefits, and that they expect ATOS to find 89% of people fit for work. The human cost of this target is huge, with 32 people a week dying after being declared fit for work. 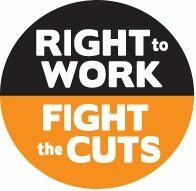 Many disabled people have died from their illness shortly after being told they are fit for work, including a local man who died of his heart condition just 3 weeks after ATOS told him he was fit to work. 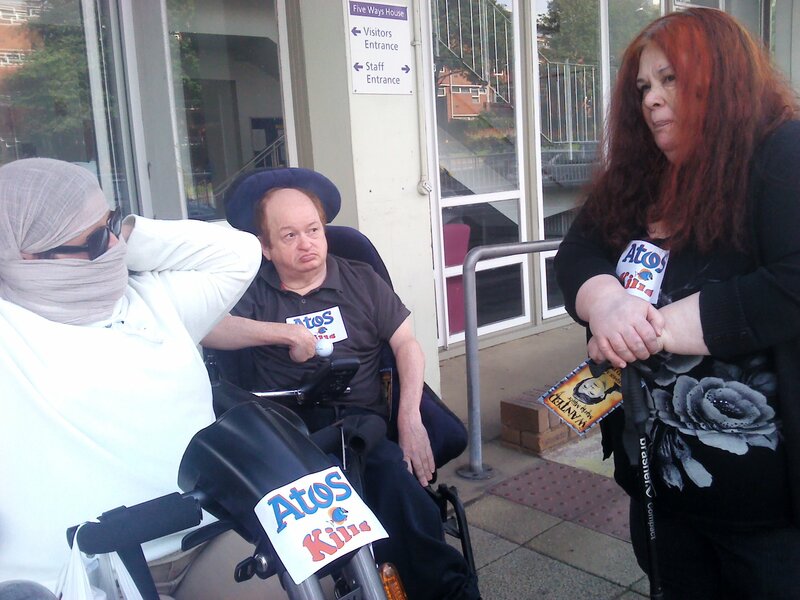 Talk to disabled people about ATOS and the one thing you will hear time and time again is fear. The fear strikes when the letter arrives calling you for assessment. This letter comes even if you have an incurable, unchanging or degenerative condition. The tests can happen annually, and some people even find themselves called for reassessment just weeks after they have had a successful appeal. Or it comes when you receive the ESA50 form to apply for the benefit, a big lump of paper, designed to scare and confuse, intended so that people will not complete it properly. If you’re filling one of these in, do get advice, especially if you have a variable condition. The fear continues as you wait for the assessment, knowing that doctors advice will be ignored in favour of a ticklist that doesn’t take into account variable conditions, doesn’t mention work and will award no points for manual dexterity if you can use one finger on one hand. (zero points means there is no problem). Fear stays there until you receive the letter telling you if you are fit for work or not. You might get put in the “support group” where it’s accepted that you aren’t going to be able to work. Or the “Work Related Activity Group” (WRAG), where they say you are fit for work of some kind with the right support (and if there were jobs available, or employers willing to take on someone who will need more time off than other people for medical appointments, or runs the risk of falling very ill very quickly.. but they don’t mention these barriers to employment of course). Or you get told you are fit for work and pushed off to JSA unemployment benefit. 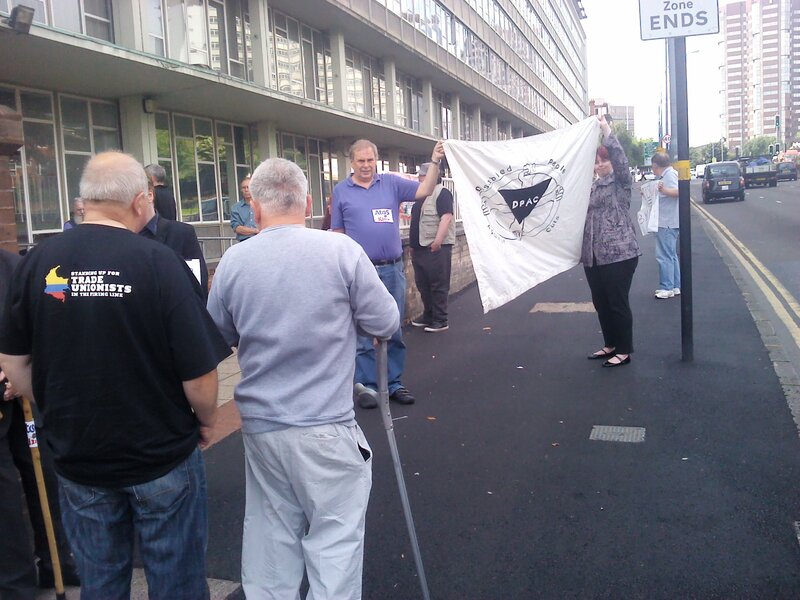 And the fear doesn’t stop then – the wait for the reassessment for those in the support and WRAG groups, the loss of income and support for those kicked off to JSA, the impending prospect of the Work Programme and workfare for those found fit for work (either in the WRAG group or like anyone else unemployed and on JSA), and the sanctions regime that has seen tens of thousands of disabled people lose benefits for up to 6 months. The fear needs to end, the WCA needs to be suspended now, and altered in a major way so that it is a fair assessment, and ATOS need to be removed from the contract. Tommorrow (Wed 29th), DPAC will deliver a coffin full of messages from you. On Thursday 30th: Phone jam! Let’s flood Atos with calls, and generate a Twitter-storm they can’t ignore! 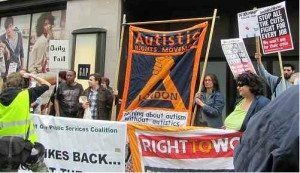 Then on Friday 31st, join DPAC in London where they’re teaming up with UK Uncut for the Closing ATOS ceremony, at ATOS HQ in Triton Square, London from 12:45. 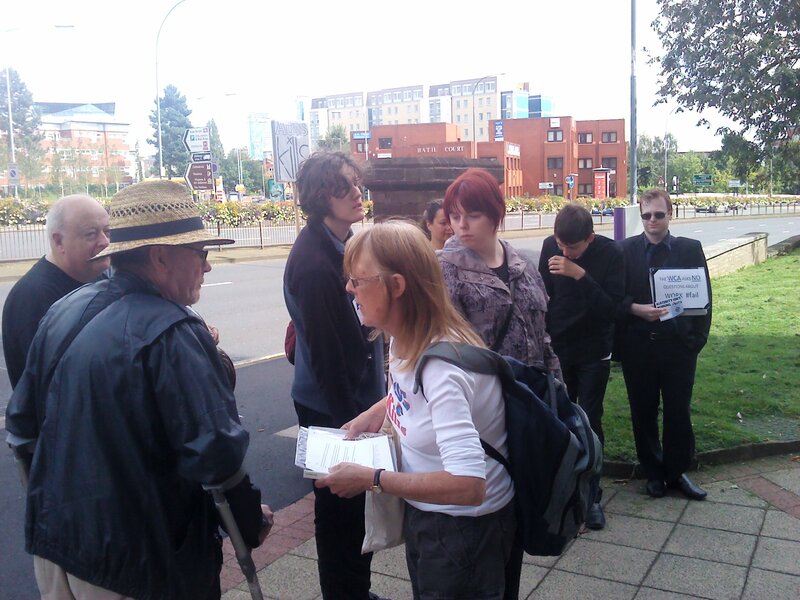 Thanks for the photos from @BrumProtestor on Twitter. More photos from Stalingrad O’Neill with thanks! 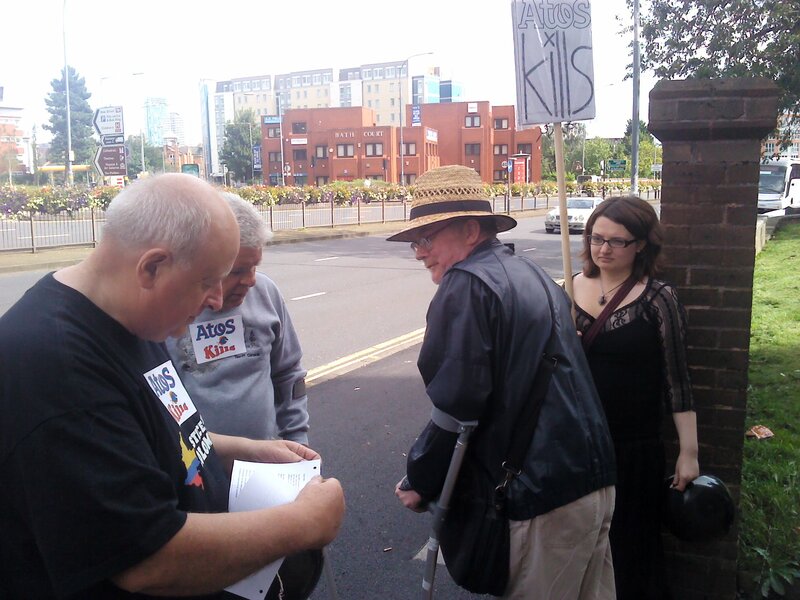 DPAC joined activists in Birmingham today from major trade unions in the city, including UNISON, GMB, CYWU, UNITE, NUT, UNITE, UCU, NASUWT, PCS, CWU as well as campaigns such as UK UNCUT, community choirs and residents associations. 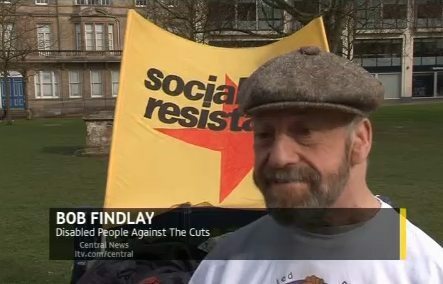 About 1,000 people marched through the city against £300 million of cuts which will devastate services and lead to 7,000 workers losing their jobs. It was said that there will be cuts of £50 million of adult care budget, 11,000 disabled people to lose their eligibility to funding, and £4 million will be cut off support for disabled pupils in schools. 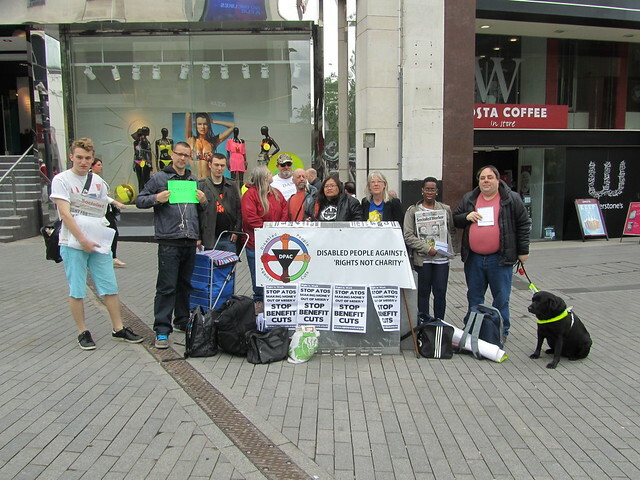 Demonstration gathered at Birmingham Cathedral and marched through the main shopping streets. As the march reached a branch of Barclays protestors stopped and chanted ‘pay your taxes’. As they reached each of Philip Green’s shops the chant was repeated. BHS shut their doors. 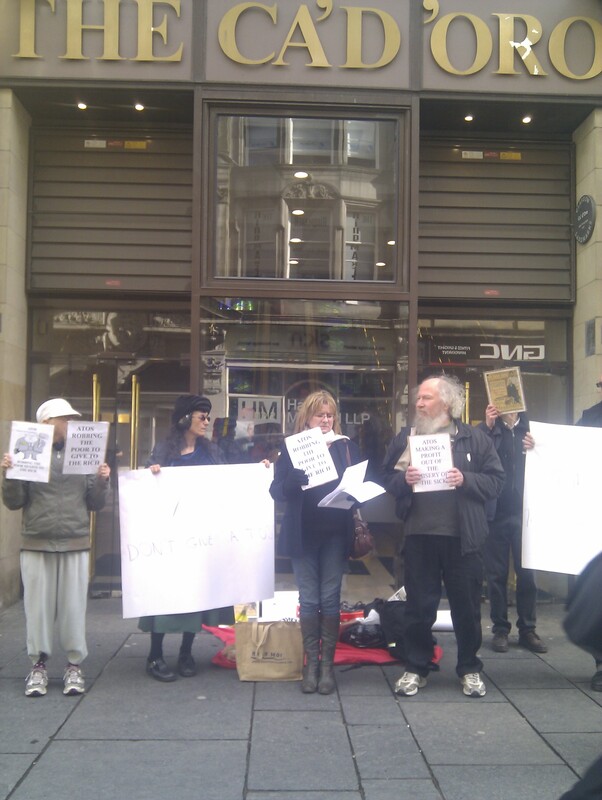 At the same time as the march UKuncut protestors were targetting a number of shops for not paying tax. 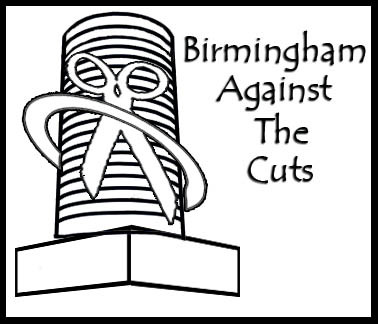 Birmingham City Council are implementing £320 million of cuts which will have a drastic and very negative impact on provision of care and support for disabled people. 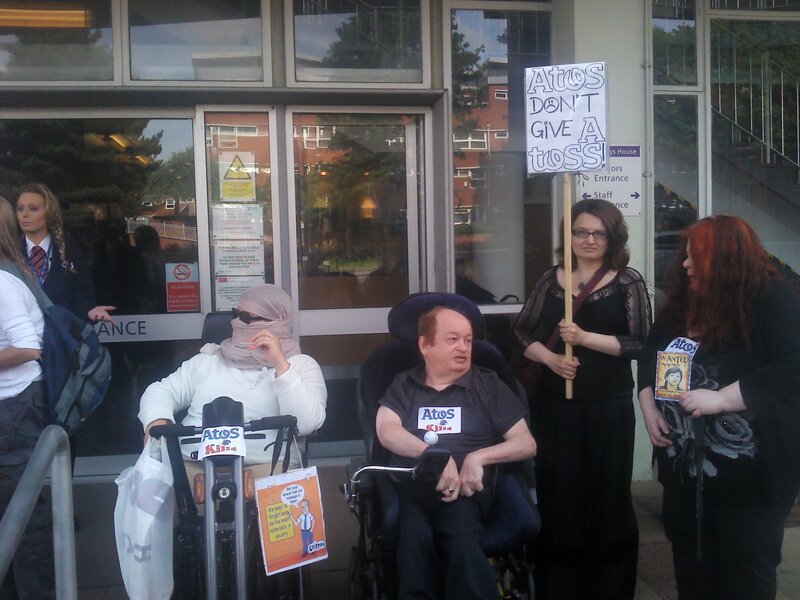 The eligibility criteria are to moved again to extra-critical only which will exclude huge numbers of disabled people in Birmingham from receiving the support they need to live inclusive and independent lives. We have submitted a FOI request to get more idea of numbers this would involve. 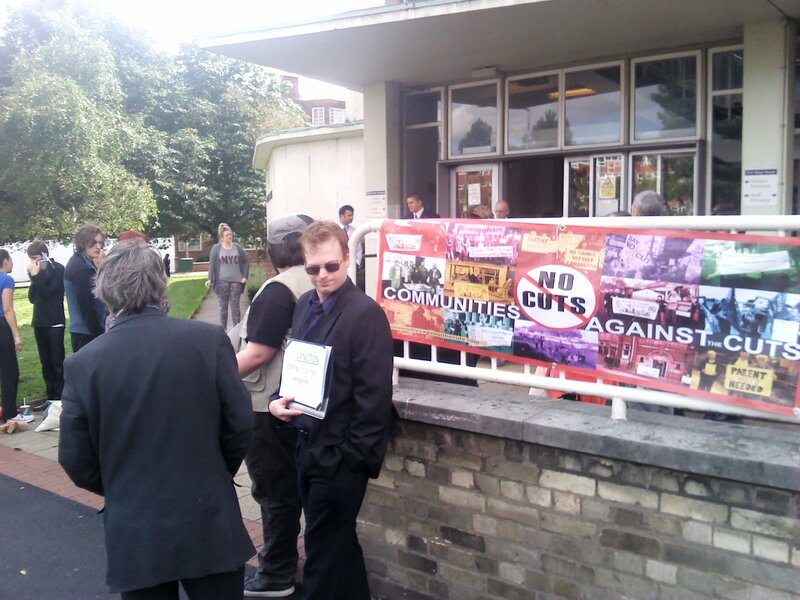 This protest is only a few days before the council meet to vote through the cuts. 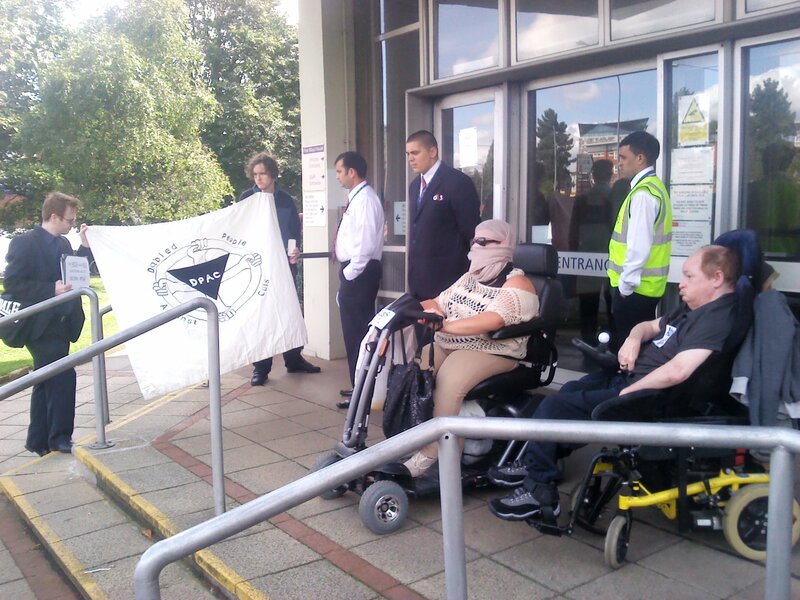 It is vital that we as disabled people have a presence at this demonstration.